These are the sausages after being boiled for 30 minutes. If you’re like me, a sale is always good to stumble upon. The other day I found ground turkey that was only half as much as it usually costs at a local grocery. Most meats are ground in-store in Nova Scotia, and since this was on sale I shudder to think where the over abundance of turkeys may have originated. It’s now July. Were they frozen turkeys leftover from Easter and taking up storage space, or maybe even from last Christmas? Perhaps some secrets are best left undiscovered. So not looking this particular gift horse in the mouth I decided to take a couple packages and make something interesting out of it. Since it’s barbecue season something to cook outside would probably be a good idea, right? If you’re like many folks, you’re probably starting to get a little tired of the usual slabs of beef or pork, hamburgers and hot dogs. So something a bit more “eclectic” might be a good thing. 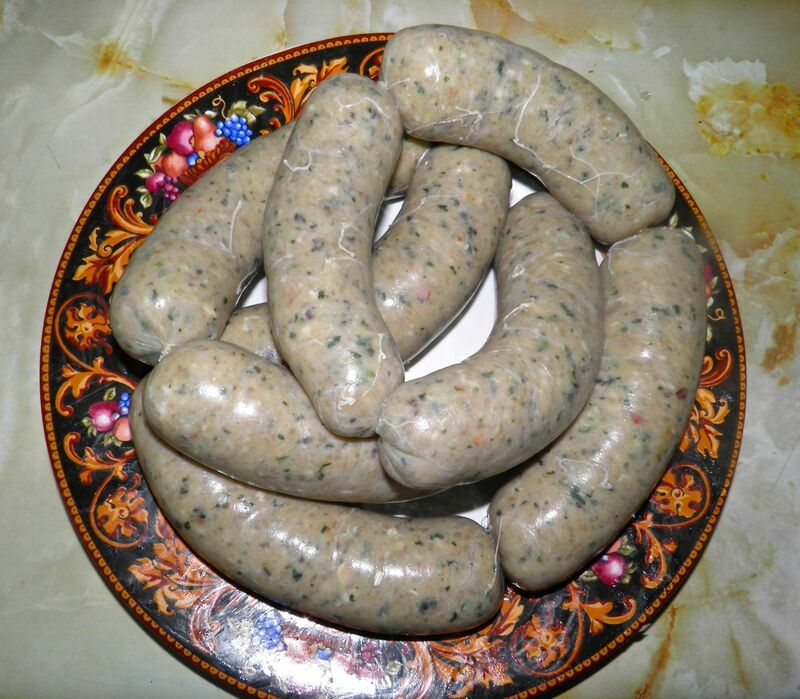 This sausage meat falls into that category: Thai turkey. It doesn’t really spring to mind when you look at ground turkey meat, does it? But they’re very good. The Thai flavours really do make for interesting eating. This recipe can be stuffed or used for patties. Either way will work well. And you don’t need a food grinder to make it. The turkey comes pre-ground, and it only takes a minute to reduce bacon to “ground” in a food processor. 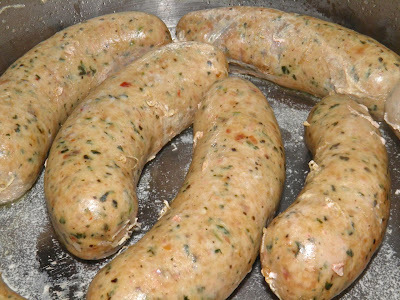 It may seem odd to include bacon in turkey sausage, but it’s there for a good reason. Turkey can be notoriously dry. If you don’t add fat in some form you will be in trouble. There’s nothing worse than biting into a dry, dry sausage. There is sodium nitrite in the recipe. This is used for longevity in the refrigerator, in case you want to keep the sausages for a week or so before use. If you don't, it's not necessary. It also helps the meat keep pink coloured. There was one other hurdle to overcome in putting these sausages to plate. What on earth do you put on them? I searched high and low for any kind of Thai condiments that might do the trick, and finally settled on something I already had in the refrigerator. Sweet Chilli Sauce. You can purchase it at almost any grocery in the International section. These were a nice break from traditional barbecue fare. Try your own toppings to see what you may like. I did find that hot/sweet paired very nicely with the cilantro and jalapeño. But feel free to break out into the unknown! You never know what path a gift-horse may lead you down. Place the bacon in a food processor and pulse until well ground. Remove to a bowl with the ground turkey. 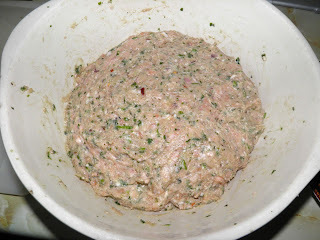 Make the paste by combining the last 6 ingredients in the food processor and pulsing until ground. It shouldn’t be completely smooth, but well ground up. Add to the meats. Add the remaining spices and sodium nitrite. If using the meat immediately for patties, the sodium nitrite can be omitted. Mix well with your hands, cover with plastic wrap and refrigerate for 2 hours, or overnight. Shape into patties or stuff into casings. If stuffing, boil the sausages in enough water to cover for 30 minutes. If the sodium nitrite has been used they will last at least 1 week in the refrigerator.